We've seen this bizarre dual-screen, split-keyboard Android phone once or twice before, but we just got some more specs. It's a whole lot of crazy and weird packed into a single phone. We thought this guy might be called the LG Flip II, but it's looking like DoublePlay may be the name that sticks. On the outside it's got 3.5 inch screen (no word on resolution, but I'm going to go ahead and guess it's low), but slide that screen over and let the freakshow begin. Underneath the main screen lies a second touch-screen, nestled between two halves of a split-keyboard. Why, you ask? Well apparently LG has made it so some apps will allow you to have one element open on the small screen and another element of the same app on the larger screen. Or you could use the screens to use two separate apps simultaneously. We've seen this kinda thing before, and it's always been an awful idea. A split keyboard is not necessarily a bad idea on a phone, but the keys look very flat, very small (thanks to the 2-inch screen hogging the real estate), very close together, and they're lined up in vertical rows. It makes my thumbs feel cramped and frustrated just looking at it. 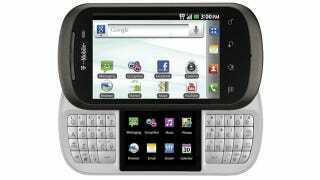 It'll have a 1GHz single-core processor under the hood, Android 2.3 (Gingerbread), a 5MP camera on the back, and likely 4G with T-Mobile's HSPA+ (if that little 4G icon on the phone is correct).